Essex Mark Province makes a £1000 donation to "SAFE"
R.W. Bro. 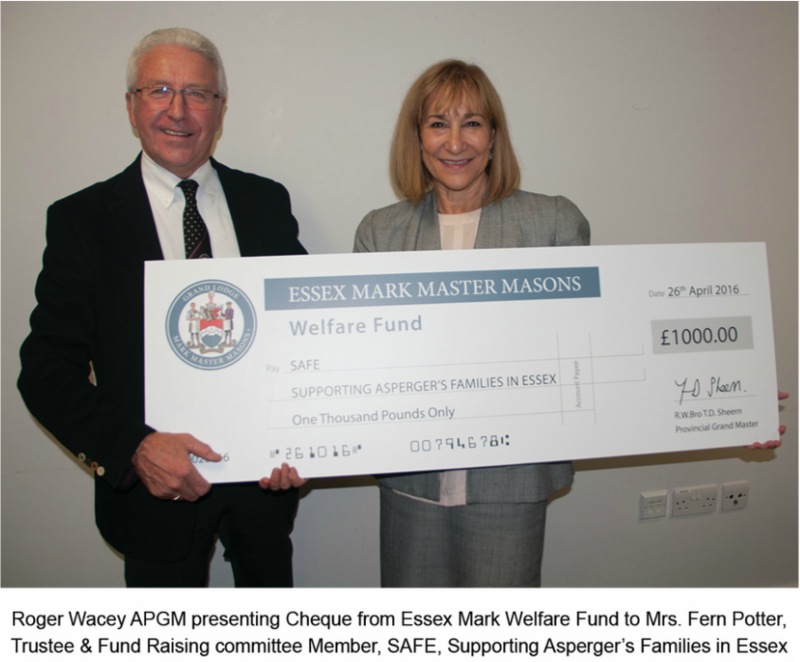 Terrence D. Sheern announced that, as a Province, we would be supporting an Essex Charity and, after, discussion with the Mark Welfare Fund Trustees, the chosen Charity was to be "SAFE"; Supporting Asperger's Families in Essex, and that an immediate donation of £1,000 was to be made. On Wednesday, 26th October, W.Bro. Roger Wacey, APGM, had the privilege of being invited to the SAFE Annual General Meeting, held at the Marconi Sports & Social Club in Chelmsford to make the very worthwhile and important presentation on behalf of the Mark Master Masons of Essex. There were approximately fifty interested people in attendance and a further eight members of their Executive Committee (all of whom are volunteers and who give a great deal of their time free to assist in the important work that this charity undertakes). It appears, from what was said, that no responsible authority has the inclination or resources to help in this area of Autism. This area of need appears to be particularly lacking in assistance or understanding from potential funding streams. There are several organisations which assist through schools particularly for younger children, but when they leave they appear to be on their own. Further, should they gain a diagnosis, they then appear to fall off the radar to fend for themselves with only help from families, but with very little other support except from SAFE. Following the decision to make a donation to SAFE, the Provincial Charity Steward, Peter Maloney, accompanied Roger Wacey to the Belchamps Scouting Centre, Rochford, to see the Charities youth team leader operating SAFE STUFF when about 20 Children were having a great time and, trying to contact the Team Leader, telephoned her mobile only to find that she was only a few feet away, within what looked like a square shed with no windows or doors--it was in fact a cave simulator which had 6 or 8 children exploring in the dark, and having a great time. They then moved on to a friendly and fun competition of tug of war, an extremely enjoyable event for the children which gives them many opportunities to make friends, which is very difficult for them. Asperger's is seen as a communication deficit disorder, where people are miss read as they may appear to repeat the same question or might appear arrogant and obstinate when they do not receive a definitive answer to a request for information. This often gets them into trouble with authority and in extreme cases, if not diagnosed, can lead to prosecution or imprisonment. However if the right help is available, sufferers can be dealt with in a far more understanding and SAFE way! At their AGM, the first speaker was also a Mark Master Mason, from the Beaconsfield Lodge of Mark Masters, No. 205, and a past Mayor of Southend, W. Bro. David Norman, MBE, who, as a long term friend of SAFE, presented the SAFE Achievement Award for the 18+ group. In a final note, W.Bro. Roger Wacey, said that "I have found this experience immensely informative and rewarding and hope that we can continue with our help for this very underfunded but sincere charitable organisation". To that end, relying on the organisation to provide ongoing budgetary information and action plans on how the money will be spent, Essex Mark Masonry intends to continue to support SAFE as a charity.